Note: the following post provoked a lawyer’s letter on behalf of Antonia Joussen, demanding its removal and a personal damage compensation of up to €80,000. Read the letter here. Antonia Joussen is head of the Department of Ophthalmology at one of the most renowned German university clinics, the Charité in Berlin; prior to this, she led the ophthalmology clinic at the University of Düsseldorf. Her CV lists numerous awards and professorship appointments, more than 200 publications with her co-authorships are listed on PubMed. In 2015, accusations of data manipulation were raised against several of these publications on PubPeer, namely against those few containing cell biology images. After the editors were notified, and institutional investigation took place, only one paper was corrected, one received an editorial note of concern, others were seemingly forgotten. Precariously, in two cases image integrity suspicions were neglected where Joussen was not only responsible as the key author, but also as the Editor-in-Chief (EIC) of the journal where these papers were published. All this evidence originally surfaced and was reported to journals and institutions well over a year ago. Not really much has came out of it since. Apparently, science had better things to do than self-correcting. “Overall there was rather an atmosphere of intensive control of all work – it was always clear who managed everything and that everything was controlled”. Originally, I was alerted to these image irregularities by the a certain well-known pseudonymous whistleblower. 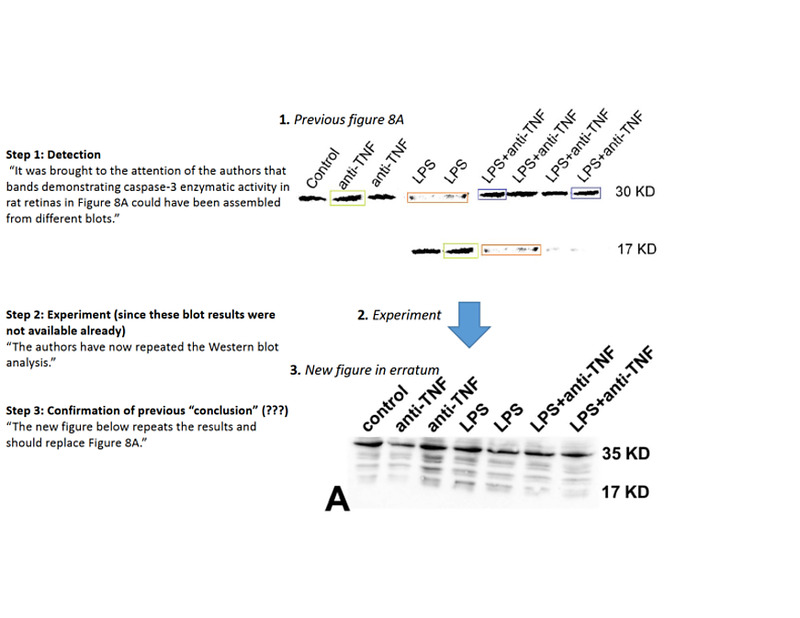 Some western blot bands seem very similar, which prompted PubPeer commenters to suspect band duplication and intentional image manipulation, like in Joussen et al, 2009. The responsible EiC of the journal Molecular Vision was notified by me of these irregularities in February 2015, yet apparently saw no reason to act. Sometimes seemingly entire images (Semkova et al, 2010) got duplicated, or gel lanes were spliced inappropriately (Semkova et al, 2006), yet the journals Experimental Eye Research and FASEB J chose not to act either. The latter irregularity is a quite common concern in Joussen’s publications, several more may be undetectable due to artificially boosted brightness of the gel photographs, which removes all background and with it any potential traces of digital manipulation. Lane splicing makes it difficult to trust the published data where the loading controls seem to belong to different gels than they are supposed to. “In autumn 2012, Springer received a hint that the publication Joussen AM, Kirchhof B., Periphere Netzhautdegenerationen—Behandlungsempfehlungen. Ophthalmologe 2004 Oct;101(10):1035-47, showed similarities with the publication Lewis, H., Peripheral retinal degenerations and the risk of retinal detachment. Am J Ophthalmol. 2003 July; 136 (1): 155-60 [link to paper here, -LS]. 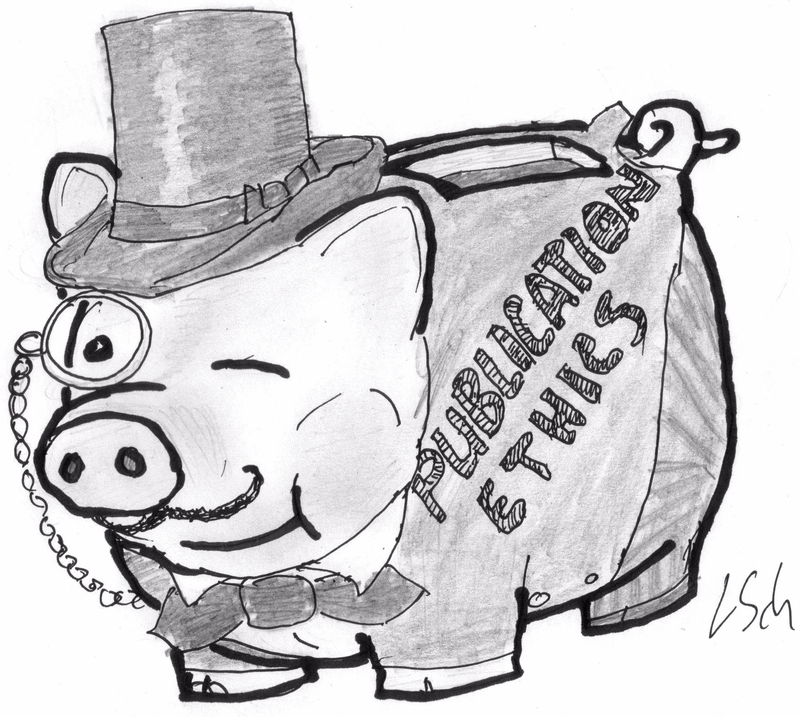 Even though the whistleblower has remained anonymous, editors and the publisher investigated the hint in accordance with the recommendations of the Committee on Publication Ethics (COPE) and decided together with the authors to withdraw the contribution because too large content overlap was found. Here, the text passages from the publication by Lewis et al. have been borrowed, but not figures or tables”. The American Journal of Pathology issued in June 2015 a Note of Concern about image duplications in a Poulaki et al 2002 paper, co-authored by Joussen during her postdoctoral research in the lab of Anthony Adamis, professor at Harvard Medical School in Boston (more recently also head of ophthalmology research at the company Genentech). “reported for alleged scientific misconduct. Harvard investigated the accusations thoroughly. At the end Dr. Poulaki was exonerated of all accusations”. “all papers with Dr. Adamis were investigated by Harvard, and such defamations can be lacking no basis” . Since Harvard Medical School apparently found out that nobody did anything wrong, it was hardly surprising that that Note of Concern in American Journal of Pathology had no consequences so far, just as another one at the same journal to Adamis name (see RetractionWatch report). Adamis’ personal assistant repeatedly notified me that Dr. Adamis “regrets he will be unable to talk to you due to the serious time constraints of his current commitments and business travel plans”. “Our Editor was alerted. We feel there is no reason to further investigate at this point. If we hear word from the institution that some misconduct occurred we can then take appropriate action”. There were indeed some institutional investigations. The Berlin Charité briefly investigated Joussen’s publications in early 2015, and decided that the bulk of the 19 criticized Joussen papers lied outside of their responsibility. One could dispute this supposition; since it were Joussen’s pre- Charité publications, which were decisive for her current recruitment as head of ophthalmology to this university clinic. “the University Hospitals of Cologne and Dusseldorf and the Harvard Medical School have been contacted by me with a request to carry out investigations of the incriminated work”. Bähr also stated that a correction had been submitted for Semkova et al, Exp Eye Res. 2014. The Corrigendum appeared in July 2015, with duplicated images replaced, and authors declaring that “the error does not affect the results and conclusion of this study”. There are in fact very good reasons for the Charité not to investigate more publications of Joussen’s than strictly necessary. Joussen’s research and networking brings tremendous amount of funding money to the clinic. The international joint project REVAMMAD received from EU in 2013 €3.8 million for retinal vascular research, and in 2014 VISICORT raised €5.8 million of EU funding for research on corneal transplants. Joussen’s ophthalmology department at the Charité is the major partner in both consortia. “The University of Cologne will soon address the incriminations against publication of Prof. Joussen. The conclusion of the investigation is to be expected in the time course of one year”. On the phone Depenheuer told me today, the investigation is about to be concluded and its results announced any time soon. However, are these image integrity concerns really that serious that university commissions and journal editors should waste their precious time investigating? “Lane splitting/swapping: This is unfortunately widely practised (I was shocked when I saw people doing it as it were a natural things to do) – it is sometimes needed to bring the lanes in a logical order for presentation. […] BUT: A good researcher will repeat the results multiple times, and at least on the last repeat one will run a gel that is specifically done for publication, because by then, the results are known and thus the desired logical order of lanes is in mind. Therefore: the need to splice lanes is at best an indication that the result have not been repeated but collated, possibly from one-time observations in various contexts. REPEATED reuse of same bands in different contexts – that is hard to explain otherwise than with fraudulent behavior. The very minimal likelihood that in the process of legitimate cut/past embellishment for presentation reasons, as discussed above, an innocent mixed-up sneaked in, can be barely considered given the high frequency of the cases listed in these examples, and the logical consistency of the appearance of the bands with expectation. Together this suggests directed manipulation with intend to mislead”. “I suggest that what we see is at best poor science, sloppy science and at worst, signs highly indicative of intended deception. Even if the actual result would have been the same had the author used original, unmanipulated “ugly” gels, it is just dishonest to not show authentic results to the community”. “In the Boston group of Prof. Adamis each employee was individually questioned by him about the validity of his data, before a paper was submitted. A Japanese colleague then retracted his own data for a publication after such conversation. I had nothing to do with this incident. The workgroup afterwards repeated all relevant data in double-blinded experiments. This example is cited in my group when it comes to the necessary critical evaluation of data – which is essential before any publication – sometimes data cannot be published if there is any uncertainty about its origin or outcomes. This is strict, but indispensable for each research group”. Question remains then, how did all these suspicious irregularities sneak into Joussen’s publications, with so much strict control on her side? Protection of Joussen’s privacy (though it were actually her publications which the university investigated). “Unfortunately, an error occurred during the compilation of the composite Figure 3. Accidently the left panel of Figure 3a showing retina without surgery was transposed with the right panel of Figure 3a showing retina after surgery without tamponade. Both panels are now presented in the correct order. As no differences amongst both panels were detected the error does not affect the results and conclusion of this study. The authors apologise for any confusion that may result from this error”. “The authors regret that an error occurred during the compilation of the composite Figs. 4 and 6. One panel representing an immunostained retina section of a laser-treated wild type mouse was used accidently both in Fig. 4 (middle panel in the lower row (WT)) as showing nidogen-1 antibody staining and in Fig. 6 (middle panel in the lower row (WT)) as showing laminin-y1 staining. Both retina sections were now replaced with new sections showing the correct immunostained retinas of laser-treated wild type mice. As in the analyzed genotypes the distribution as well as the intensity of nidogen-1 and laminin-γ1 immunostaining were similar the error does not affect the results and conclusion of this study. The authors would like to apologise for any inconvenience caused”. “During the compilation of the composite Figure 5, two identical graphs for untreated controls for MMP-3 and TIMP-2 were used by mistake. Figure 5 is invalid”. “It was brought to the attention of the authors that bands demonstrating caspase-3 enzymatic activity in rat retinas in Figure 8A could have been assembled from different blots. The authors have now repeated the Western blot analysis. The new figure below repeats the results and should replace Figure 8A”. It is very hard to believe that either in Antonia Joussen’s case or Sonia Melo/ R.Kalluri/ M. Esteller or Susana Gonzalez/Manuel Serrano [edited, -LS] cases, etc that the respective lab heads did not know everything about. Ein Sprichwort stimmt – »A bad workman blames his tools.«. [. . . Friedhelm] Herrmann claims that when he was working in Berlin he left the running of the research projects in the hands of his four group leaders. Although he says that he read closely all the papers he co-authored, he did not recognize that data had been forged. “But neither did the journals’ referees” says Herrman.